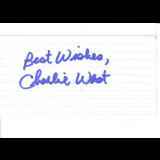 Charlie West is a former safety who played for three National Football League teams. He played in Super Bowl IV as a member of the Minnesota Vikings. He also still holds the UTEP career record of 19 interceptions, including a school record four in one game. Today, he presently lives near New York City and coaches the Carmel High School football team in New York serving as the defensive coordinator. New Response (Success): Sent (4) 1972 Topps and signed them all.